Could book lovers finally be willing to switch from pages to pixels? Now it is out of stock and unavailable until February. Analysts credit Oprah Winfrey, who praised the Kindle on her show in October, and blame Amazon for poor holiday planning. The shortage is providing an opening for Sony Corp., which embarked on an intense publicity campaign for its Reader device during the gift-buying season. The stepped-up competition may represent a coming of age for the entire idea of reading longer texts on a portable digital device. “The perception is that e-books have been around for 10 years and haven’t done anything," said Steve Haber, president of Sony’s digital reading division. “But it’s happening now. This is really starting to take off." The company's latest model, the Reader 700, is a $400 device with a reading light and a touch screen that allows users to annotate what they are reading. Haber said Sony’s sales had tripled this holiday season over last, in part because the device is now available in the Target, Borders and Sam’s Club chains. He said Sony had sold more than 300,000 devices since the debut of the original Reader in 2006. It is difficult to quantify the success of the Kindle, since Amazon will not disclose how many it has sold and analysts’ estimates vary widely. Peter Hildick-Smith, president of the Codex Group, a book market research company, said he believed Amazon had sold as many as 260,000 units through the beginning of October, before Winfrey’s endorsement. Others say the number could be as high as a million. Many Kindle buyers appear to be outside the usual gadget-hound demographic. Almost as many women as men are buying it, Hildick-Smith said, and the device is most popular in the 55-64 age group. So far, publishers such as HarperCollins, Random House and Simon and Schuster say that sales of e-books for any device—including simple laptop downloads—constitute less than 1% of total book sales. But there are signs of momentum. 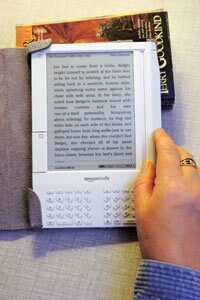 The publishers say sales of e-books have tripled or quadrupled in the last year. Amazon’s Kindle version of The Story of Edgar Sawtelle by David Wroblewski, a best-seller recommended by Winfrey's book club, now represents 20% of total Amazon sales of the book, according to Brian Murray, chief executive of HarperCollins Publishers Worldwide. The Kindle version of the book, which can be downloaded by the device itself through its wireless modem, costs $10 in the Amazon Kindle store. The Reader version costs $12 from Sony's e-book library, accessible from an Internet-connected computer. Even authors who were once wary of selling their work in bits and bytes are coming around. After some initial hesitation, authors such as Danielle Steel and John Grisham are soon expected to add their titles to the e-book catalogue, their agents say. “E-books will become the go-to-first format for an ever-expanding group of readers who are newly discovering how much they enjoy reading books on a screen," said Markus Dohle, chief executive of Random House, the world’s largest publisher of consumer books. Nobody knows how much consumer habits will shift. Some of the most committed bibliophiles maintain an almost fetishistic devotion to the physical book. But the technology may have more appeal for particular kinds of people, such as those who are the heaviest readers. Perhaps the most overlooked boost to e-books this year—and a challenge to some of the standard thinking about them—came from Apple Inc.’s do-it-all gadget, the iPhone. Several e-book-reading programmes have been created for the device, and at least two of them, Stanza from LexCycle and the eReader from Fictionwise, have been downloaded more than 600,000 times. Another company, Scroll Motion, announced this week that it would begin selling e-books for the iPhone from major publishers such as Simon and Schuster, Random House and Penguin.